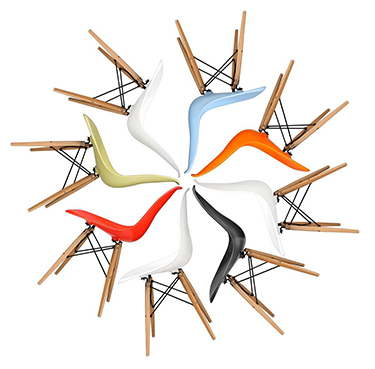 The Eames LCW Chair is perhaps the most famous chair of all time. Hailed by Time Magazine as the Best Design of the 20th century, it is described as 'something elegant, light and comfortable'. With its low-slung frame and gentle curves that expertly cradle the body, the LCW offers unparalleled style and relaxation. A traditional lounge chair, the LCW stands for Lounge Chair Wood, the chair is the perfect place to unwind with a cup of coffee and good book. The chair is strong and durable, sculpted from layers of oak, beech and walnut, and finished in natural ash wood. The distinctive wooden legs have rubber shock mounts to cushion against jarring movements. Charles Eames pioneered new wood moulding techniques while working on MGM film set design. But it wasn't until after World War II that he was able to turn his attention to applying these processes to furniture design. The LCW chair began as an experiment in the Eameses apartment, where a bicycle pump was used to inflate the wood as it was heated. A humble start for what would become one of most popular and famous chairs in the world. The LCW chair is together with the DCM, DCW and LCM Chairs part of the famous Plywood Group. Today, the LCW is on permanent display at international design museums, including the MoMA in New York.